One of the most talked-about movies of last year’s Busan International Film Festival, featuring a tragic, real-life story about a Samsung employee, is getting a theater release next month. The film, funded solely by donations and crowd funding from more than 7,000 individuals, recounts the life of Hwang Yu-mi, a factory worker who died of leukemia at age 23 in 2007 after working for four years at a Samsung memory chip factory. Titled “Another Promise” (previously “Another Family,” equivalent to Samsung’s well-known slogan), the movie mainly revolves around the victim’s father Hwang Sang-gi, a Gwangwon Province-based cab driver, and his legal battles to win compensation for his daughter’s illness and death. A Seoul court in 2011 ruled that the cases of leukemia suffered by two former Samsung factory workers, including the late Hwang, could be regarded as an industrial accident. The film had its world premiere at last year’s BIFF. The film begins with Yoon-mi (played by actress Park Hee-jung), a stand-in for daughter Hwang, landing a job as a factory laborer for a company called Jinsung shortly after graduating high school. The main reason the young girl wants to earn money is to help support her family, especially her younger brother. She wants to pay for his tuition when he goes to university in the next two or three years. Her father Sang-gu (played by actor Park Chul-min), a taxi driver in Gangwon Province, is proud of his daughter for getting a job at the biggest company in the country. But Yoon-mi becomes severely ill four years later, gets a cancer diagnosis, and dies in the backseat of his cab. After learning that a number of Yoon-mi’s coworkers at the factory are also suffering unlikely diseases, Sang-gu is convinced that Jinsung is responsible for his late daughter’s disease and death. He makes a visit to a labor attorney (played by actress Kim Gyu-ri) to file a claim against the most powerful conglomerate in the country. 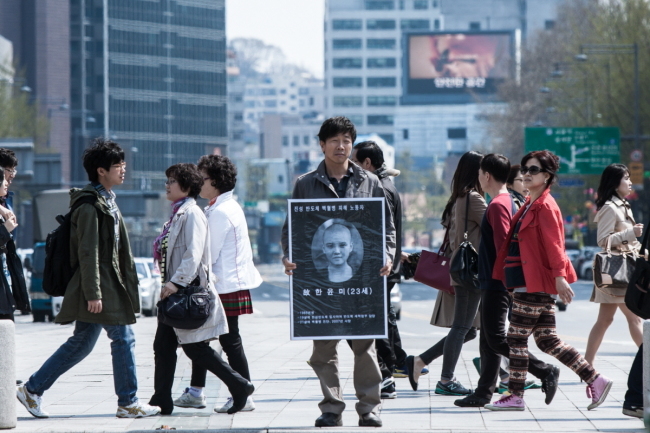 The movie follows the challenging journey of Hwang and other victims’ families. Samsung, the world’s largest technology company and a major contributor to the South Korean economy, is also one of the world’s biggest advertisers. Hwang Sang-gi revealed in 2011 that the conglomerate asked him not to file an industrial accident claim for his daughter’s case, and said they would pay him 10 billion won if he accepted their request. Hwang rejected the offer. The film recounts the 10 billion won offer, as well as Hwang’s unyielding will to win the legal battle. All of the actors and actress starred in the film for free. “Another Promise” is the first film in Korean cinematic history to have been both invested and produced solely by private donations and crowdfunding. Actress Kim Gyu-ri and actor Park Chul-min revealed during a press conference on Monday that those who could not donate funds brought other goods instead for the crew, such as cookies, drinks, bags and even kimchi, to show their support. In spite of a number of its cinematic flaws, “Another Promise” and the way it was produced is a meaningful achievement in Korean cinema, as well as for Korean democracy. “Another Promise” opens in theaters on Feb. 6.